The unwanted Manchester City keeper could get the nod for Champions League play-off along with Yaya Toure. Joe Hart is being lined up for what could be his farewell game at Manchester City tomorrow night. The Blues keeper looks increasingly certain to leave the club, with new number one Claudio Bravo flying into Manchester today to complete the formalities of what is expected to be a £17million move. Hart is almost sure to leave the club before the transfer deadline next week, if City find a buyer to meet the asking price. And with Hart having such huge respect both at the club and among the fans, he may play against Steaua Bucharest, as the Blues lead 5-0 from the first leg. Manager Pep Guardiola also said that Yaya Toure , left out of the squad which won 5-0 in the first leg of the Champions League play-off in Romania last week, could play. 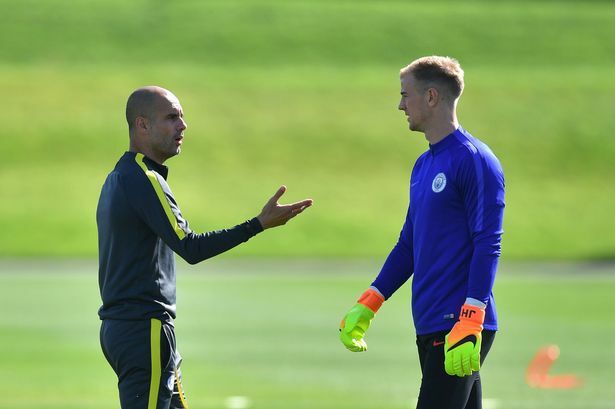 He later denied reports he had a bust-up with Hart on the training pitch, saying: “I have an excellent relationship with Joe. He is clear with me and me with him. So could this be his last game? “I don’t know. I’ve said many times he’s our player. Until the 31of this month, all the players here are our players, my players. I work with them like there is no end.